Representing two painting styles of eastern India, this exhibition includes a male tradition of scrolls from Bengal and a female tradition of wall paintings, now done on paper, from the Mithila region of northern Bihar. Both of these art forms have morphed and changed in contemporary India, creating space for artists to use their art to comment on issues facing their lives, their nation and the planet. Their work deals with a variety of injustices such as violence against women, female infanticide, political corruption, climate change, and war. From the collections of Geraldine Forbes, Distinguished Teaching Professor Emeritus of SUNY Oswego, and Susan Wadley, Ford Maxwell Professor of South Asia at Syracuse University. 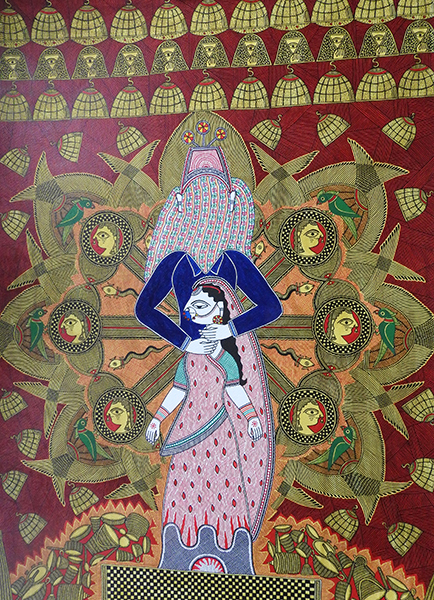 Until the 1960s, Mithila art was done only by women on the walls of their houses around ritual occasions—festivals, marriages, births and other ceremonies. It was also an art form painted almost exclusively by high caste women—using a highly colorful form by Brahman women and black and red line drawings by Kayastha women. In the late 1960s as a form of famine relief, the government introduced women to drawing on paper, making their one-time ritual art a commodity to be sold. These initial paintings on paper primarily celebrated the gods and goddesses known across India and familiar to Hindus generally. During the 1970s, the lower caste Dalit community developed their own renditions of an art form termed godhana, after the tattoos common in their community. Unlike the high caste paintings, their art celebrates their hero, the god Raja Salhesh, a figure unknown to the Sanskritic Hindu pantheon. Nowadays, Mithila art, from all communities and with a merging of the older caste-related styles, essentially eliminating the caste association with style, fills the handicraft markets of Delhi and other Indian cities, as well as museums in the U.S., Japan, and Europe. And a few artists have had their work recognized by modern art galleries across India and beyond. 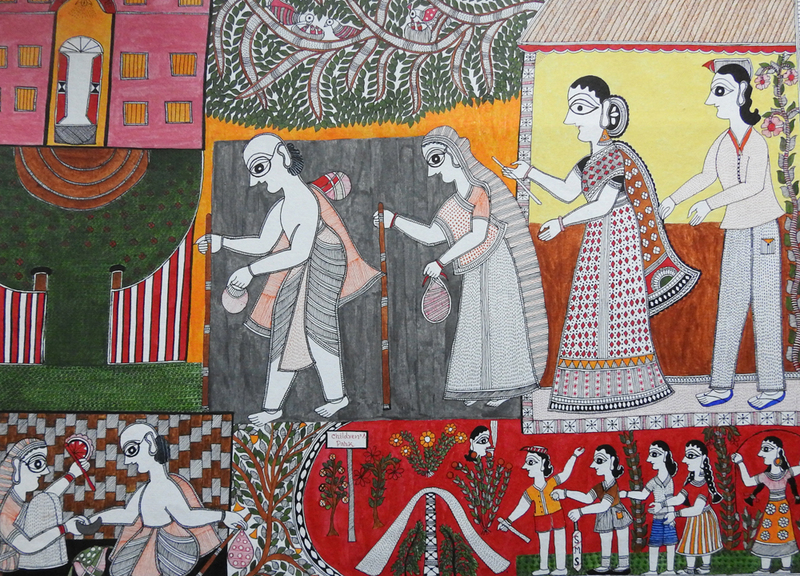 The patuas of Bengal are folk artists who paint story scrolls. In the past, they wandered from place to place, singing the story as they unrolled a scroll. In return for their performances, they received money or food. The patuas from Medinipur and Birbhum, the two districts of West Bengal where this art is still practiced, generally have two names: one Hindu and one Muslim. The origins of this are unclear, but it appears these picture-makers, belonging to one of the nine ancient artisan castes, converted to Islam after the Muslims Turks came to Bengal in the 13th century. Their way of life includes customs from both communities. They practice circumcision and bury their dead, but have a wedding ceremony with Hindu rituals and do not believe in polygamy. They paint and compose more songs about Hindu gods and goddesses than about Islamic topics, and have never practiced any form of veiling. The patuas were well known for their commitment to communal harmony but in the last few years, Communalism has taken its toll. Although very poor, the patuas produce exuberant, colorful art, which can serve as a window on both popular and traditional culture. Always dependent on patronage, they painted stories from the Ramayana and Mahabharata as well those of Muslim saints and gods and goddesses worshiped specifically in Bengal. By the mid-nineteenth century, they were also reporting events and scandals. As patronage shifted, they added folk stories and historical events to their repertoire. In the 1980s, NGOs tapped their potential for influencing rural people and commissioned them to paint anti-dowry scrolls as well as scrolls about the environment, health issues, and the treatment of women. By the 1990s, NGOs had begun to work with the patuas on their social issues. Following the formation of a Mahila Samiti [Women’s organization] in the village of Naya, a number of women, and some men, became more vocal about social inequality. Galvanizing events in the 2000s: the Indian Ocean Tsunami of 2004, the resistance of peasants in Nandigram against eviction to make way for a chemical factory in 2007, and growing evidence of environmental degradation and climate change have become subjects of patua art. A donation of $100 will list you as an exhibition sponsor.